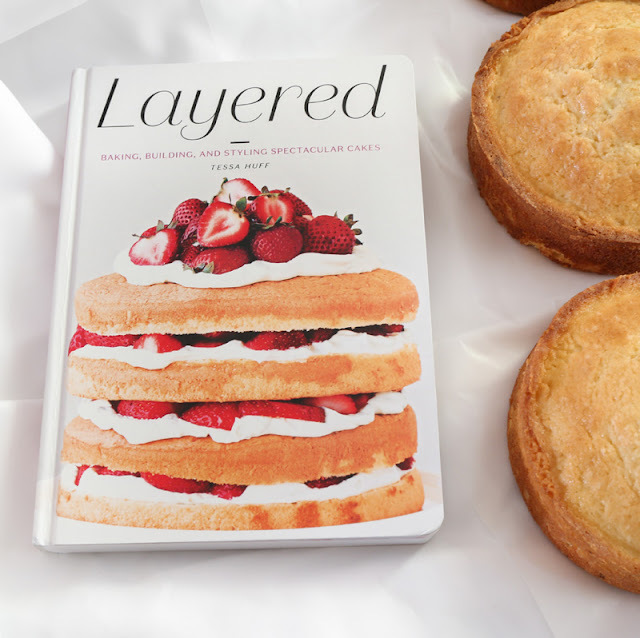 Today I'm sharing a recipe from the brand new cookbook "Layered: Baking, Building, and Styling Spectacular Cakes". 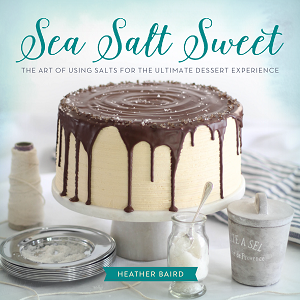 My pal Tessa of Style Sweet CA wrote it, and she's packed it full of dazzling cakes of all kinds! I was immediately drawn to her recipe called "The Birthday Cake". It's one of those recipes that EVERY baker needs in their recipe box. 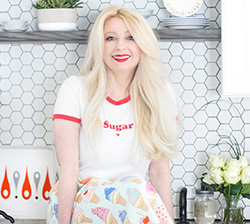 Tessa says "If you don't already have a go-to yellow cake recipe, this is it. Memorize it and pass it along. Your future grandchildren will thank you." Truly, it is a great little recipe. As far as scratch-made cakes go, it's an easy fix. The yellow cake is fluffy and golden-hued thanks to 6 egg yolks and and a whole cup of butter. The fudge frosting is just as the name implies; rich, chocolaty and the flavor is a bit nostalgic for me. 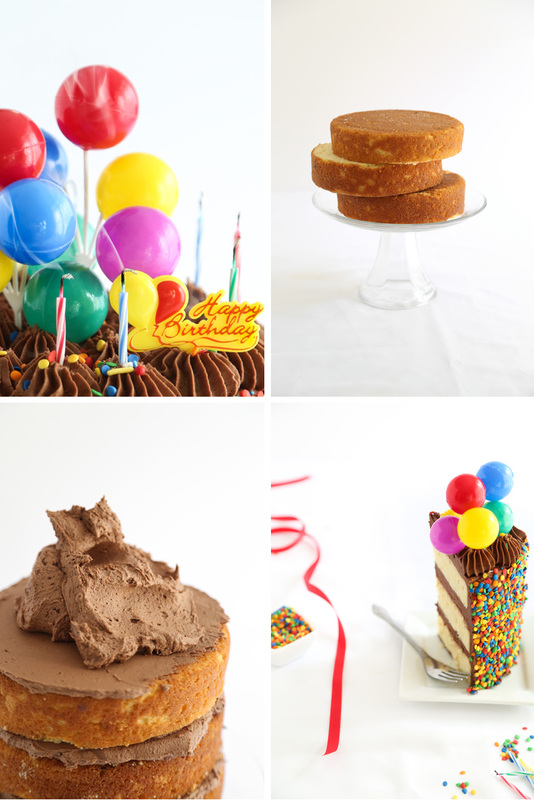 There's just something about yellow cake with chocolate frosting that makes me feel like a kid again (and sprinkles - always sprinkles). The book is utterly gorgeous with full color pictures for each recipe. 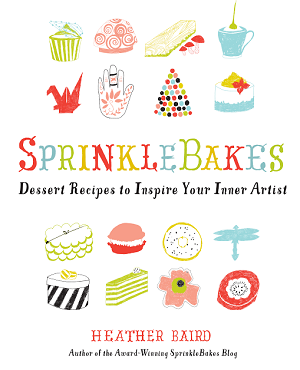 Inside you'll find 60 cakes with 150 recipes for cake layers, frostings, fillings and edible garnishes. At 288 pages, this is a new type of Cake Bible for bakers of every skill level! The pages preceding the recipes are packed with baking and building instructions. It's like cake school in a cookbook! 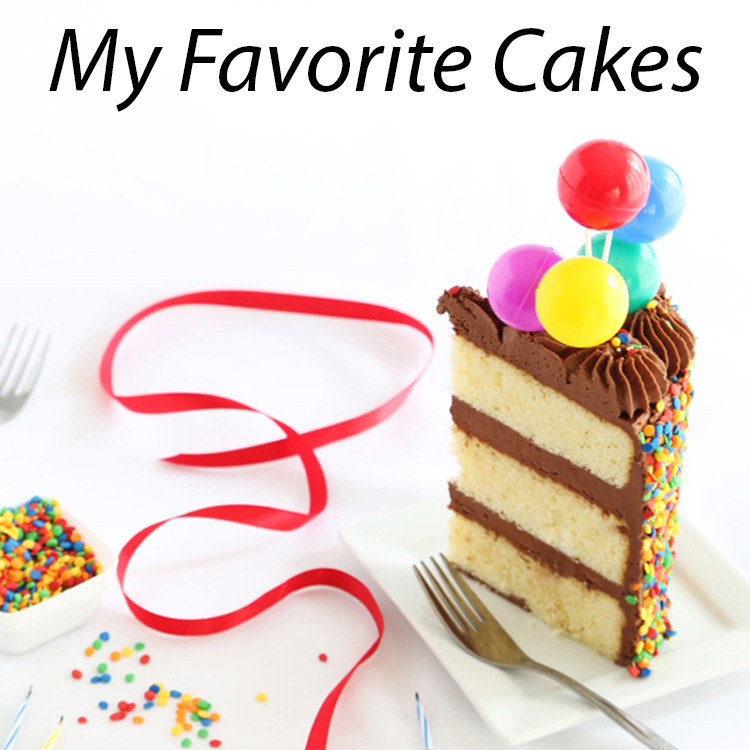 The book's chapters are divided into Classical Cakes, Chocolate Cakes, Casual Cakes, Whimsical Cakes, Adventurous Cakes (my fave! ), and Holiday Cakes. There's also a bonus Three Tier Wedding Cake recipe. You'll love having recipes for classics like Black Forest Cake and adventurous eaters will enjoy Pink Peppercorn Cherry Cake and Banoffee Tiramisu Cake. I baked this cake in three 6-inch layers which gives the cake a tall silhouette. 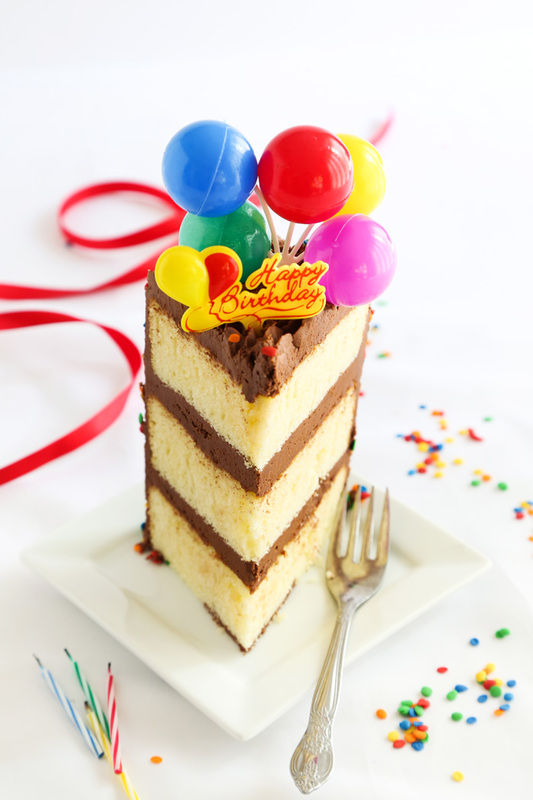 The original recipe calls for two 8-inch cake pans, but it's lovely any way you stack it! 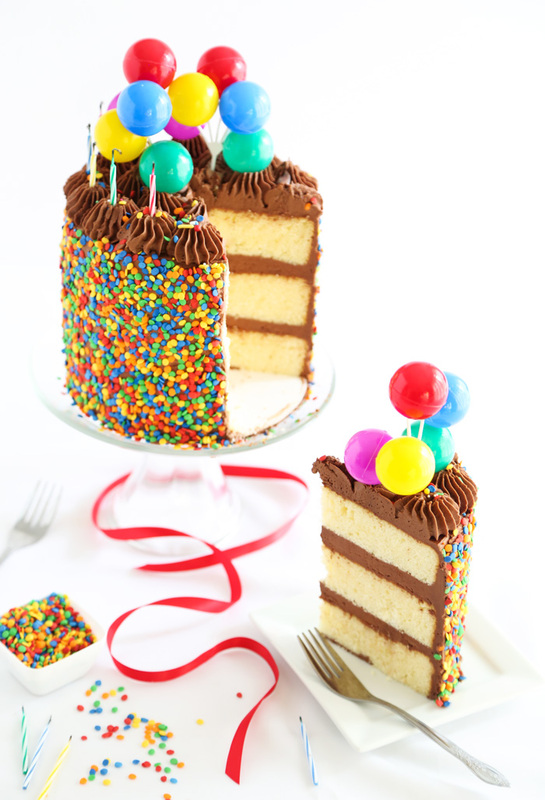 I've rarely made a birthday cake without sprinkles, and this one is no different! 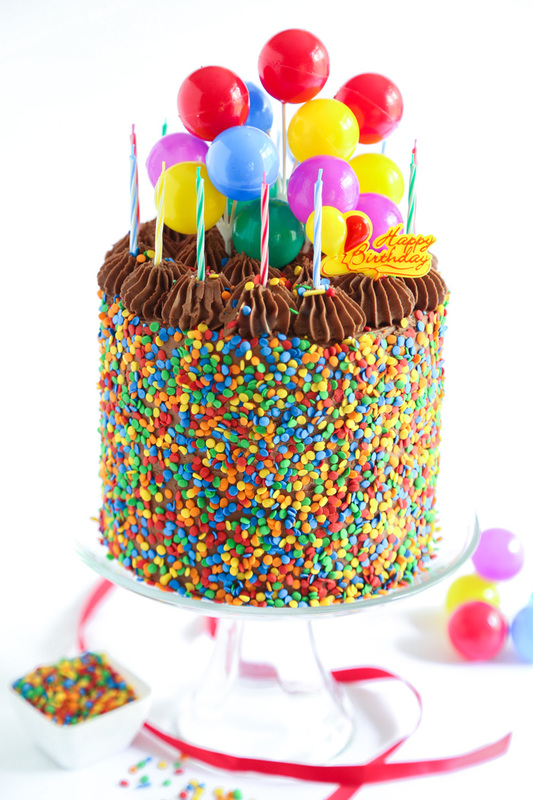 I used rainbow confetti sprinkles to cover the outside of this cake and you can find my sprinkle-coating technique in this blog post. 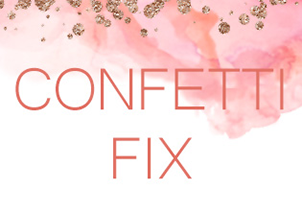 The confetti sprinkles can be found at most craft stores. 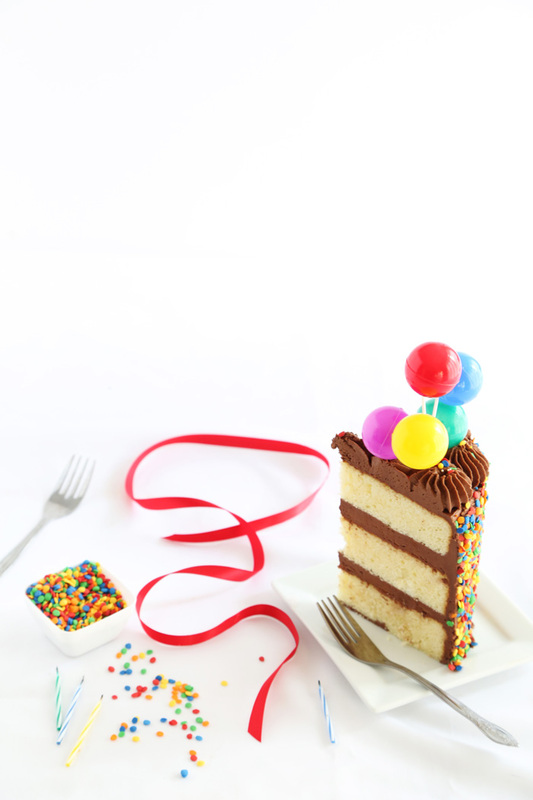 You can find the balloon cake toppers I used on this cake here. If you love baking cakes, then you'll love Layered. It also makes a great gift for the baker in your life. One last little bitty thing - today (4/21) I'm taking over the Go Bold with Butter Instagram account! I'll be making a recipe from their site using REAL butter that's perfect for springtime. You can find more info HERE, or follow along with the hashtag #GBWBxSprinkleBakes. This recipe is from the cookbook ‘Layered: Baking, Building, and Styling Spectacular Cakes’ by Tessa Huff. Recipe printed with permission (Abrams). Make the butter cake: Preheat the oven to 350°F. Grease and flour two 8-inch cake pans and set aside. Sift together the flour, baking powder and salt and set aside. In the bowl of a stand mixer fitted with the paddle attachment, beat the butter on medium speed until smooth. Add the sugar and mix on medium-high until the butter is light and fluffy, 3 to 5 minutes. Stop the mixer and scrape down the bowl. Turn the mixer to medium-low and add the vanilla and egg yolks, one at a time. Stop the mixer and scrape down the bowl. Turn the mixer to low and add the flour mixture in three batches, alternating with the milk, beginning and ending with the flour mixture. Mix on medium for no more than 30 seconds after the last streaks of the dry ingredients are combined. Evenly divide the batter between the prepared pans. Bake for 25-28 minutes, or until a toothpick inserted into the center of the cakes comes out clean. Let them cool on a wire rack for 10 to 15 minutes before removing the cakes from their pans. Make the fudge frosting: In the bowl of a stand mixer fitted with the paddle attachment, beat the butter until smooth and creamy. With the mixer on low, gradually add the confectioners’ sugar, cocoa powder, vanilla and salt. Pour in the cream and mix until incorporated. Turn the mixer to high and mix until the frosting is light and fluffy. Stop the mixer and scrape down the bowl. Add the chocolate and mix until smooth. Assemble the cake: Once the cakes have completely cooled, carefully halve them horizontally to create four even layers of cake (see Baker’s Notes following). Level the cakes and choose which layer will be at the bottom. Place it on a plate or serving dish. Spread on 3/4 cup (180 ml) of the fudge frosting with an offset spatula. Place the next layer of cake on top and repeat. Frost with the remaining fudge frosting. 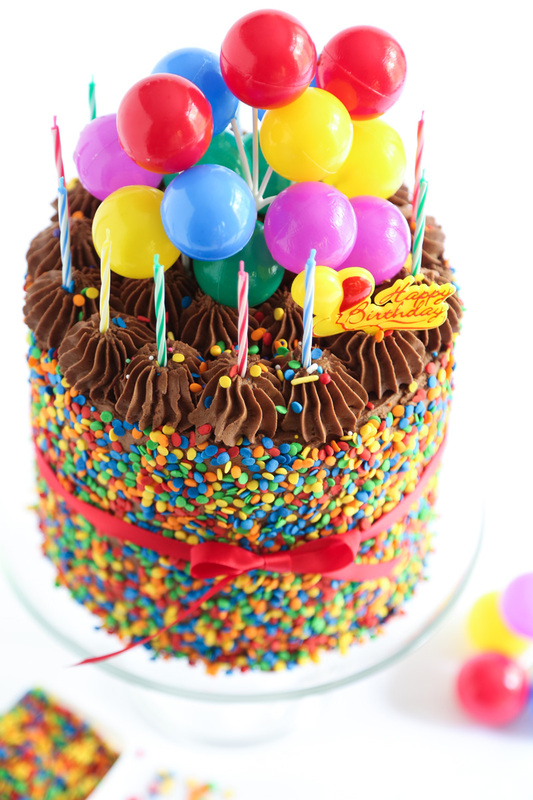 Decorate it: Toss on some colorful sprinkles or add a handful of candles for an extra-festive element. Baker’s notes: If you would prefer a two-layer cake, keep the two cakes whole. Adjust the filling amount accordingly, using 1 to 1 1/2 cups (240 to 360 ml) of the fudge frosting between the two layers. The cake will keep in the fridge for up to 4 days; it may also be frozen. I need this book and cake! This looks incredible!! Love how the little balloons look too! Think this'll have to be the next book in my collection! I love this cake. You made me embrace the 3 layer narrow cake and this is yet another example of how to gild a lilly! This cake is perfect! Love the layers and frosting! I NEED THIS BOOK!! And my gosh, will you come to Arkansas and make my next birthday cake?!?!?! I absolutely love your blog and look forward to every post! Your photos are amazing. I now need to go buy this book!!! Mmmm..this Birthday Cake looks so delicious! Thank for sharing the recipe. Your cake turned out PERFECTLY! I love it so much! Could you bake this in four 8-inch pans and adjust the cook time? If so, how long would you recommend? Did anyone else find that the frosting was more like fudge? It didn't take the sprinkles - they needed to be pushed in.